I have created a fusion clip with a short text animation that should be used as intro. This fusion clip is 10 sec long. Now I would like to add some more text animation. For this the original fusion clip needs to be 5 sec longer. I do not find a way to do that. Is it really not possible to changing length of an existing fusion clip? I looked for adjustments allowing me to change the duration time from 10 to 15 sec. Did not find something. I tried to simply expand the fusion clip in the edit tab – it does not work. Any suggestion how to solve or work around this? If you copy nodes they will retain the length of the original clip. You have to click on the Keyframes button in the Fusion tab and change the duration of each node from there. Thanks Eric for that information! But I am not able to worke out how do that: Using Resolve 15.0.0B.065, when I activate the Keyframes window in the Fusion tab I see the bars for all the nodes I have created. And off course I see their length (number of frames). By left click on a particular bar (node) I can use a slider to shorten the bar (= length of the node?) from either the right or the left side, but not extend it. So, I tried the different options I get by a right click on the bar or on the name of the node. But I can not find a field with the time value or number of frames. Number of frames are to be seen in the Metadata window, but no way to change this. Finally, there is a small button right under all the bars in the Keyframes window, offering “time”, “T-Offset”, “T-Scale”. Towards the right hand of it is a blank field/space, but you can not type a value in here. So, I may have overlooked the correct option for the change of the duration or I may have searched at the wrong place. I am also looking for a way to extend a fusion clip. I have not found a solution yet. 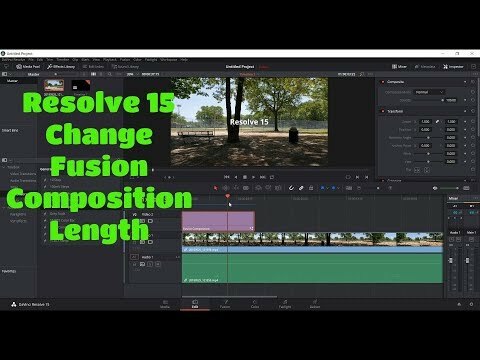 Here is a video on how to change the length of a fusion clip. I tried the two methods, but I'm still not able to extend the length. Right clicking on the clip and selecting "change clip duration" did nothing. Creating a new clip and copy and pasting the nodes doesn't work either. I'm not able to paste anything. Not sure what I'm doing wrong. Right click fusion clip on Edit timeline and select 'Open in Timeline'. Extend clip/clips to desired length. Go back to main timeline by double clicking Timeline in the path displayed below the timeline. Extend the fusion clip on the main timeline. Works fine mostly, but I did have some weird glitches and hangs when using the fusion Text+ effect.